Searching for the source of a jamming signal, Kira Nerys discovered a secret door on the Founders' homeworld. 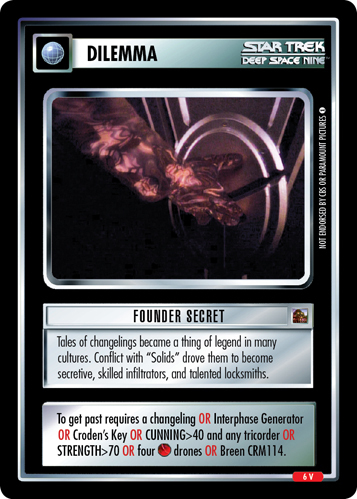 The lock was designed to be worked by changeling physiology. To get past requires a changeling OR Interphase Generator OR Croden's Key OR CUNNING>40 and any tricorder OR STRENGTH>70 OR 4 drones OR Breen CRM114.